Conny Ochs is one of those dark folk masters who has managed to carve a niche out for himself in several sonic worlds. 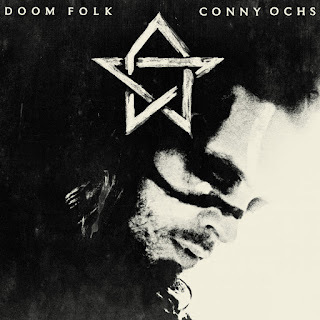 There is a deep emotional power to what Conny Ochs is doing on Doom Folk that is mesmerizing and powerful. This is an artist who is deeply talented and who with simple arrangements, just the man and his guitar (And sometimes drums and synths), he is able to unleash something that is going to draw you in and from which you are never going to want to escape. This is the kind of deeply powerful emotional stuff that I can't help but to love. The cries to humanity in tracks like Oracle speak to the kind of artist that Conny Ochs is. His work here is fascinating, it speaks to the simple magic of the shared Western experience. My roommate who has never before been exposed to the mans work is sitting here asking me to play it on repeat, fascinated by the offering here. This is a record that ebbs and flows but also which in its sort of monochromatic power is going to keep you wholly engaged in the overwhelming power that this man has been able to channel with his voice. A truly honest statement, Doom Folk overcomes its limitations with its raw emotion. I'm curious as always to see how Conny's work evolves over the next few years. His minimalist approach is a sort of warm blanket, a reassuring look into the straight honesty of our unreality and the beauty that this music is going to always have. Conny Ochs proves that you can just craft grandiose sonic landscapes with a deep understanding of songwriting and wondrously doomed sentiments. Doom Folk is going to draw you in and make you a slave to its majestic undulating waves - so dive on in with me.